Let me begin by saying that "Toy Story 3" does not, by any means, need to be seen in the 3-D format because this is, like all Pixar features, a movie that succeeds in the simplest form of popular entertainment with emotionally engaging storytelling. No extra visual flourishes required. Traditional 2-D works just fine as it did with last year's "Up" and leaves the vibrant array of colors just as vibrant as they're meant to be. This is a story spanning back to 1995's "Toy Story" and 1999's "Toy Story 2," and the third installment of the series is fittingly more mature as it has grown up with not only the Pixar team but the viewers of the original "Toy Story." Fifteen years later, we're all older now, and yet watching the bond and interaction between these seemingly inanimate hunks of plastic is still just as engaging as it was and now even more so because of what the filmmakers, led by director Lee Unkrich (co-director of "Finding Nemo" and "Toy Story 2"), have achieved in terms of evoking a rich sense of nostalgia. Not only does "Toy Story 3" meet all expectations set by the previous installments, it exceeds them tremendously by completing perhaps one of the best trilogies ever made. This is Pixar's masterpiece. It's even better than "Ratatouille," "Up" and even better than what I previously hailed as their masterpiece, "WALL-E." The reason it soars above all others is because it is so humbled. While entirely playful and fun, it's almost nonchalantly cutting into something much deeper than what it appears, a feeling that does not so much strike you as it does arise naturally. The movie's opening is a tease as we watch Woody (Tom Hanks), Jesse (Joan Cusack) and their faithful horse Bullseye chase after the evil Mr. and Mrs. Potato Head (Don Rickles and Estelle Harris) with the help of Buzz Lightyear (Tim Allen). It's a western setting, a runaway train, not a child's bedroom like we're used to, and it's a little startling to see at first. Then enters the giant spacecraft modeled after Hamm (John Ratzenberger) and a giant form of Rex (Wallace Shawn) when things get a little crazy. Soon we realize we're watching the inside of a childhood imagination, and not just any child but Andy. You see, however, it's an old recording because Andy is 17-years-old and now preparing to head off to college. 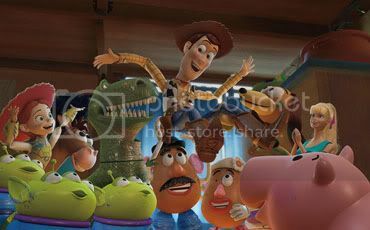 Such a beginning is motivated with a salute to making believe and sets the stage for the theme of the entire "Toy Story" franchise as it comes full circle. The gang worries about never being played with again and their consequential fate as Andy moves out. Will he take them with him, will they be stowed away in the attic or, worst of all, will they be put in a garbage bag for trash? Woody tries to get everyone's hopes up while knowing quite well that Andy has moved on from his old, childhood things. His mom influences him to sort out his belongings leaving Woody to be put in the box marked for college while the others get put in a bag for the attic. Andy's mom mistakes the bag for trash, though, sending Woody's pals to the curb. After a narrow escape, the reunited gang winds up at a local daycare center as a batch of donated toys. In just this sequence alone, a situation is presented that anyone can relate with, parents, teens and children alike. They arrive at the seemingly pleasant Sunnyside Daycare, and the toys there are led by a pink teddy bear who smells of strawberries, Lots-o'-Huggin' Bear (Ned Beatty), one of those characters who is just a little too cordial upon first greeting. He's actually a morally misconstrued monster, and the gang gets stuck being played with by toddlers who are anything but playful. From here it turns into an all-out prison break movie, and it really is just as good as any live-action adventure movie out there. The dark underbelly of something more sinister throughout their escape is no accident. And while part thriller and part horror, best of all it's laugh-out-loud hilarious and easily Pixar's funniest movie to date. When Barbie (Jodi Benson) meets a Michael Keaton-voiced Ken is comedic gold on its own accord. Visually it is not only stellar in its animation but also great to look at in terms of the way it is shot. Lighting, shading and angles are all taken into great consideration and looks like, yes, any of the best live-action cinematography out there right now. "Toy Story 3" boasts the most impeccable timing and pacing as the 103-minute running time just whizzes by, and I actually found myself wanting it to last longer. The credits may leave audiences on a silly note, the film's final frame before is a beautifully sentimental tear-jerker. Here is a movie so brilliant about generational ties, loyalty, friendship, growing up, letting go and holding on to what matters most that you'll be amazed at how easily they bring it all together. You'll be hard-pressed to find a more perfectly satisfying movie not only this summer but this entire year.